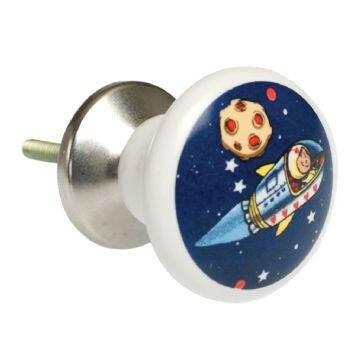 Spaceboy ceramic drawer knob - spacekids - space toys, dressing up costumes, kids spacesuits, astronaut food, cool space stuff! Spaceboy design ceramic drawer knob, white ceramic knob with a spaceboy design decal on the top. Silver metal fixtures, screw length 3cm with washer and nut.